Nebraska Cornhuskers mini helmet autographed in blue marker by former stars Roy Helu Jr. and Taylor Martinez. 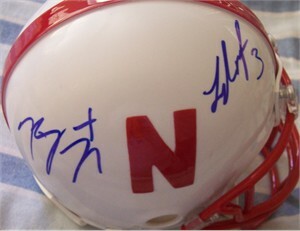 Obtained in person in San Diego at 2010 Holiday Bowl practices. ONLY ONE LEFT. With certificate of authenticity from AutographsForSale.com.